In collaboration with The VR Room we created a VR multiplayer experience aimed at people new to virtual reality. 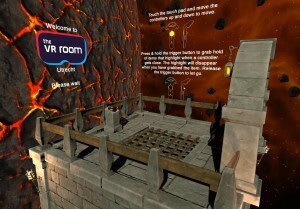 A simple obstacle course set in an environment to get the most from a first time VR experience, yet with enough of a challenge to make the competition element fun if you want it to be. This application is available for licensing through ODDZ. See the product details page for more information. This 360 video can be played back on any device that supports this feature. In a browser you can move the camera using the mouse.